Wilder Nightingale Fine Art has been and continues to assist new and seasoned art collectors acquire original art since 1990. The gallery represents over 35 leading and regional artists. The works are eclectic. From traditional landscapes in oil, pastel and watercolor the gallery also offers a selection of contemporary and abstract styles. Leading artist’s such as Rory Wagner, Michelle Chrisman, Peggy Immel, Valerie Graves, and Stephen Day make this gallery a must see when visiting Taos. Wilder Nightingale has been written up in the following national publications: Art & Antiques, Cowboys and Indians, Luxury Living, American Style and Distinction Magazine, to just name a few. 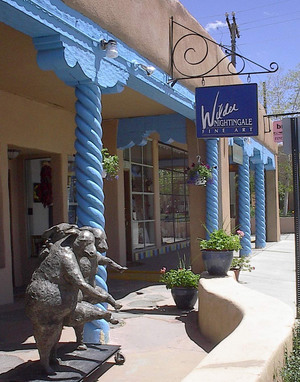 Wilder Nightingale Fine Art is a relaxed and comfortable environment and we look forward to your visit, whether to collect or simply enjoy the beauty Taos has to offer. I studied art at Columbia College in Chicago. After graduating I was thrust into the work force, but not into the art world. After several years of discontent I visited a high school friend who had moved to Taos. I liked it. I liked the variety of art. I liked the whole place. I went home, quit my job, packed up the car and moved to Taos. I have been in business for 28 years now and represent over 30 local and regional artists.